Earlier this month, I spent a delightful week over in Europe – 3 full days in Amsterdam, 3 in Brussels. While I’ll have fond memories of all of the sights we took in, as always, it’s what I stuffed my face with that I’ll likely remember most. So, here’s the rundown of much of the sustenance we enjoyed throughout the week. One thing worth noting. 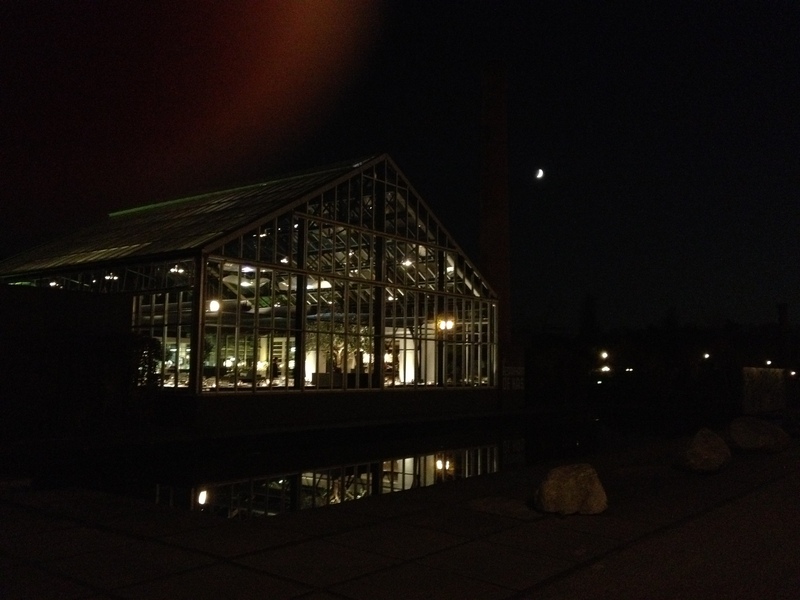 Make reservations for dinner in Amsterdam. At least on Saturday. We walked seemingly endlessly looking for a place that could accomodate. After being nixed from all of our top choices, we found solace in a cozy little Italian place that I enjoyed quite a bit, while my companion’s lasagne could’ve been a lot warmer. 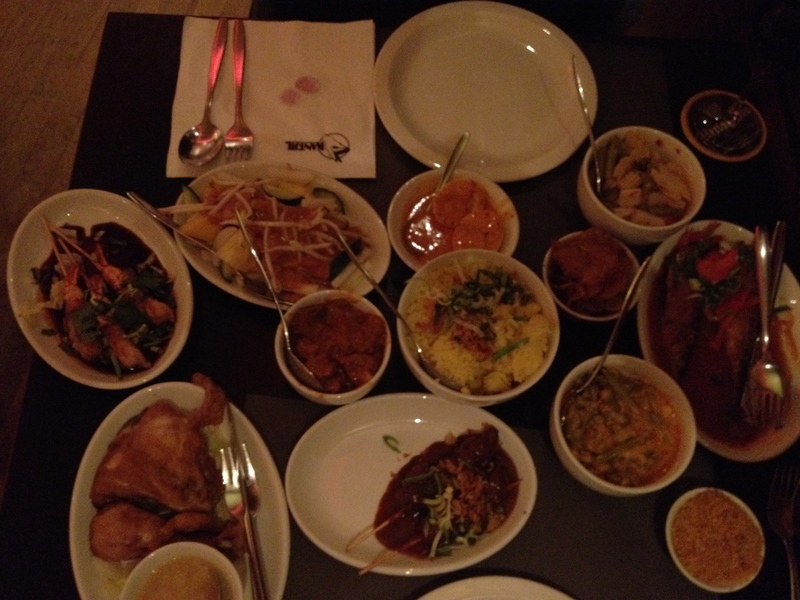 Sunday night had us tucking into a gluttonous Indonesian feast that is actually more Dutch in tradition than Indonesian. Rijsttafel is a gigantic meal of various small servings of many Indonesian dishes. 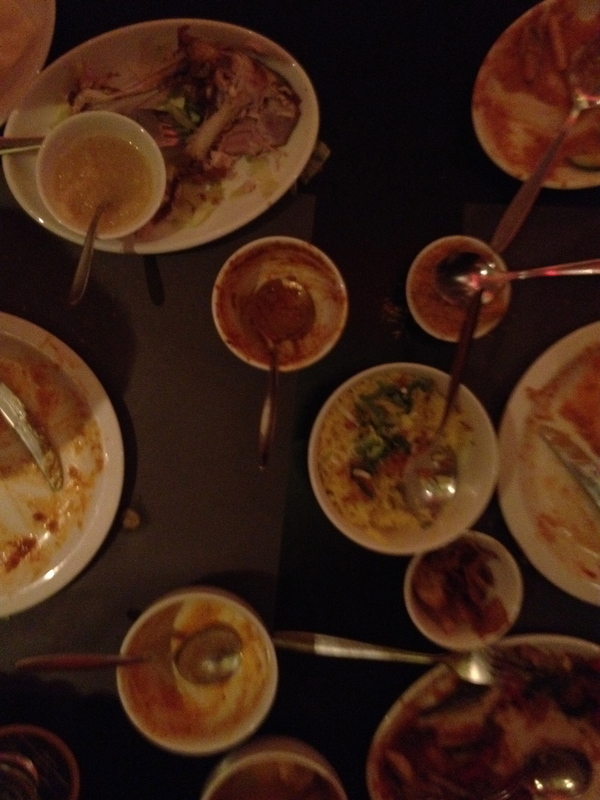 We settled on one that had about 12 different plates from Kantjil & de Tijger. The highlights were most of the vegetable dishes, especially a cold salad of cucumber and mango. For our last night in Amsterdam, we had thankfully planned ahead and made reservations at de Kas – a restaurant embracing locavore culture. In addition to the produce they grow in the greenhouse in which the dining room is housed, they’ve got their own farm about an hour outside of the city, as well as relationships with many producers of produce and livestock and seafood in the area. Before we were even handed menus, we were presented with a small round rustic bread loaf, basil oil for dipping, marinated giant green olives, bright and fresh tasting pickled zucchini, and glasses of champagne with edible flowers in them. Next up was a round of three different starters served family-style. 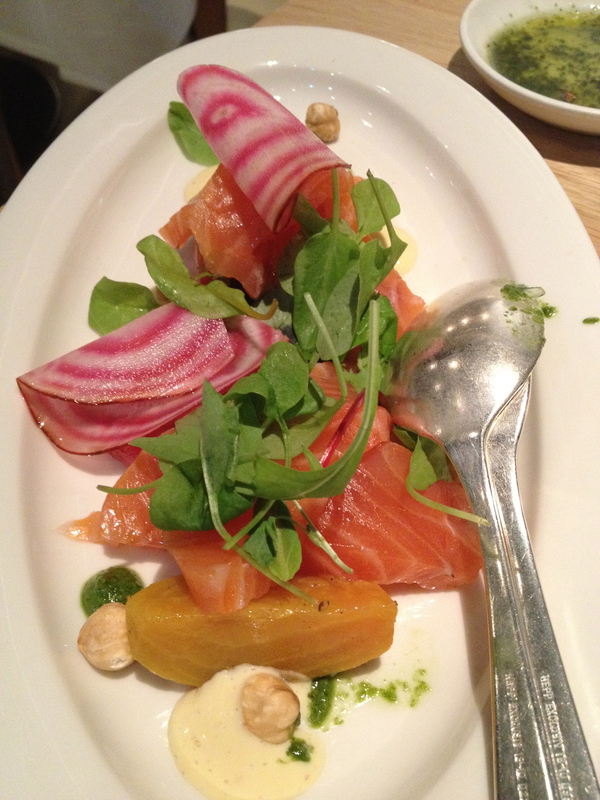 The best dish of the night was the heavily smoked salmon served with beets – both cooked and shaved raw – and hazelnuts and dressed with a lemon dressing. This course also had an eggs benedict-type of preparation and a grilled skirt steak with mushrooms. The most underwhelming course was the entree that followed – a tuna steak with mashed potatoes. The tuna was not cooked quite properly resulting in some dry spots. But the atmosphere and the rest of the meal more than made up for the lapse. 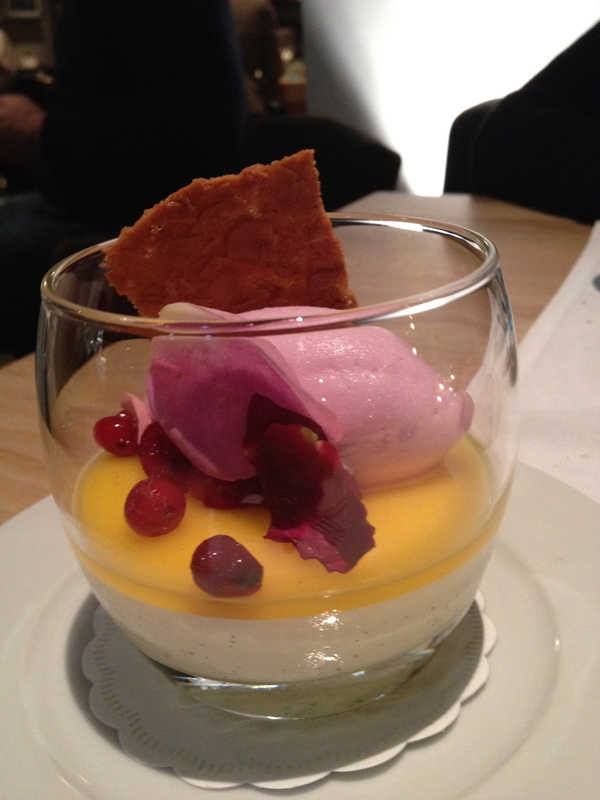 For dessert, we split a cheese plate of various French and Dutch cheeses and a vanilla panna cotta with a violet sorbet. Delicious and beautifully presented. From the crowded busy streets and restaurants of Amsterdam, we headed off to quieter, more tame Brussels. 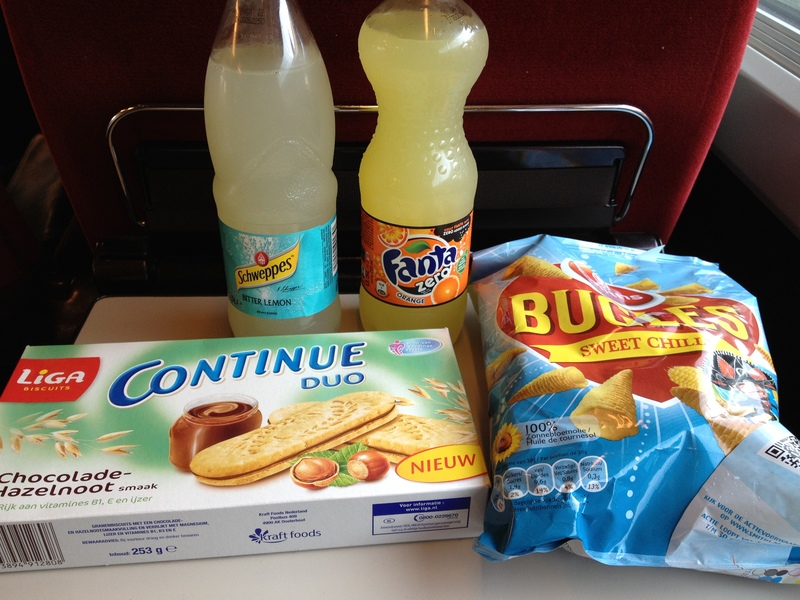 It’s worth noting our indulgence on the train ride between the two cities. Biscuit cookies with chocolate hazelnut spread, though the cookies were overshadowed by the power combo of Sweet Chili Bugles paired with Schweppes Bitter Lemon soda. 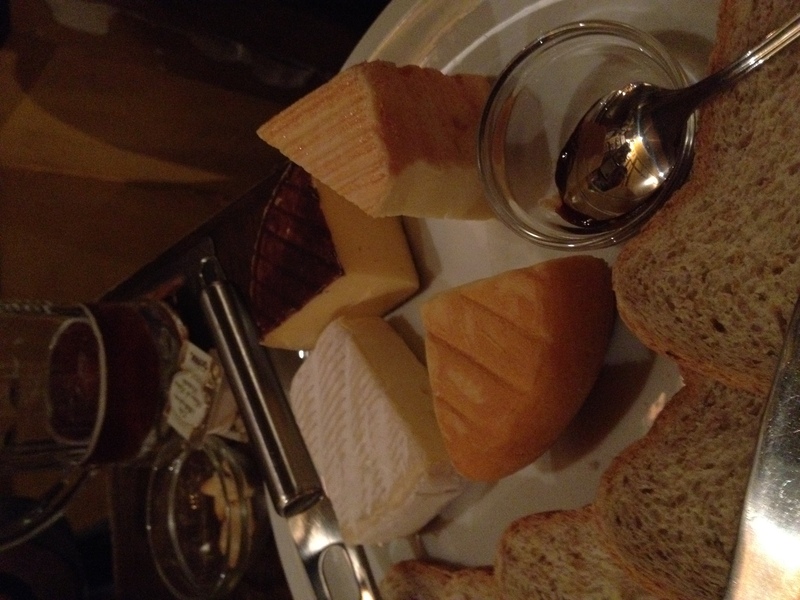 While Amsterdam for us was all about grandeur, our meals in Brussels were far more relaxed and spontaneous, quite possibly due to the copious amounts of Belgian beer that accompanied most meals. 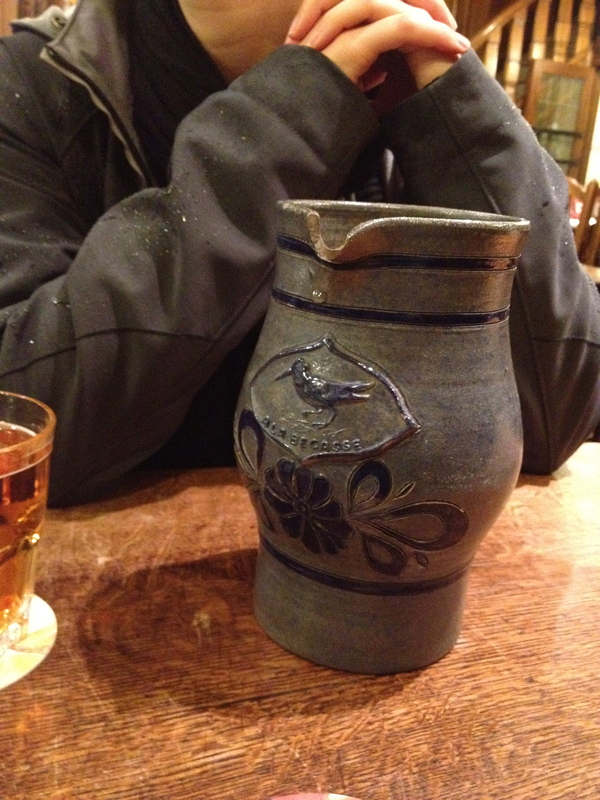 For our first night, we found a great little hard-to-find place in an alleyway called A La Becasse that specializes in Gueuze (and other) lambics served in clay pitchers – a wildly fermented drink that is more like a cider than a beer. 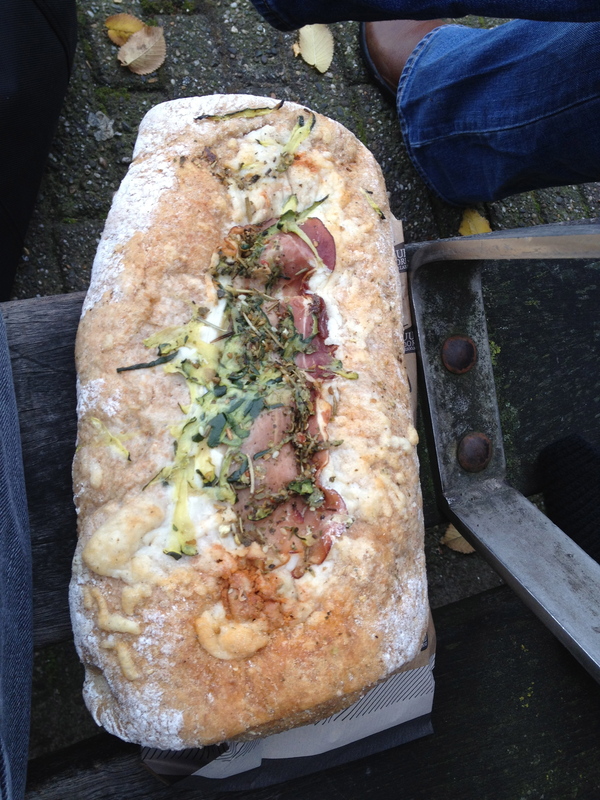 The menu offered basic open-faced sandwiches or tartines (we got a ham one and gouda one, and in true foreigner style, combined them to make a single sandwich.) And besides basic plates of cheese, salami, and wursts, they also offer lasagne, spaghetti bolognese, and spaghetti with ham and gouda. We would see similar menus in other pubs we visited. 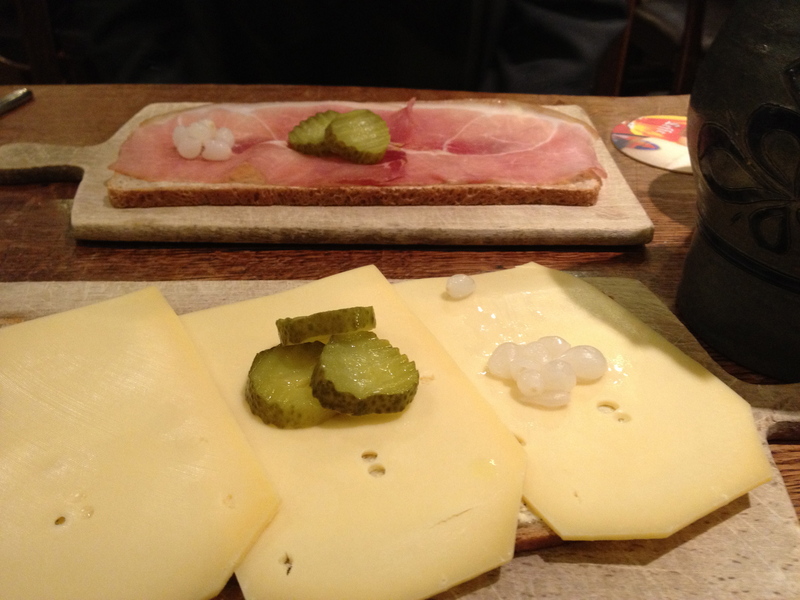 We visited another pub, the Poechenellekelder, where I ordered lambic faro by the half liter and dined on French and Belgian cheeses and pate campagne and more pickles and cocktail onions. 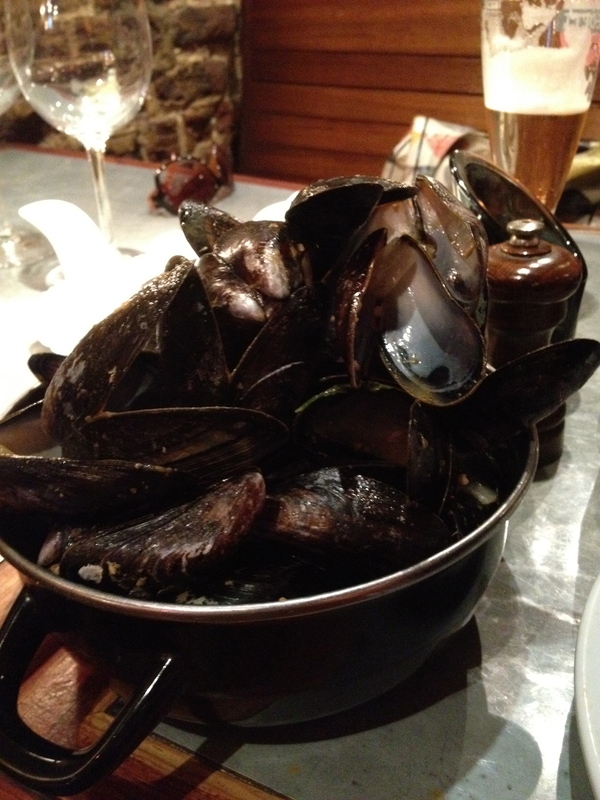 At another place, we had the obligatory serving of mussels, that were just, frankly ok. Though the broth was wickedly good. 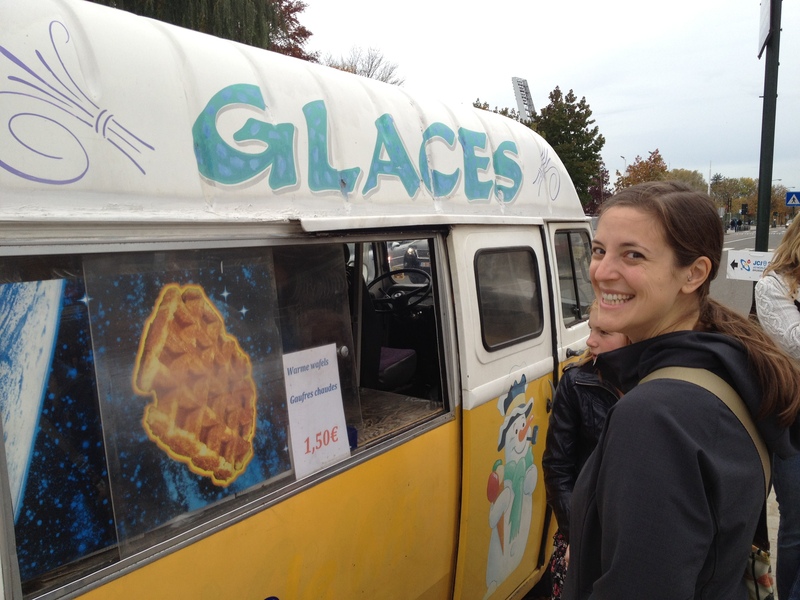 Throughout the city you’ll find Liege waffles on just about every corner and even the occasional little waffle-iron equipped truck. These are like super-Belgian waffles. They’re denser and chewier and crusted in crystallized sugar. And served piping hot and fresh. They offer all sorts of toppings, but, really, they can’t be beat just straight up. Our favorite was a truck we found just outside the Atomium. And while the waffles were hard to beat, easily the best meal we had was a lunch near Ste Catherine’s at Noordzee (Mer du Nord.) A stall out on the street that sells fresh fish, but also will cook it up right in front of you. 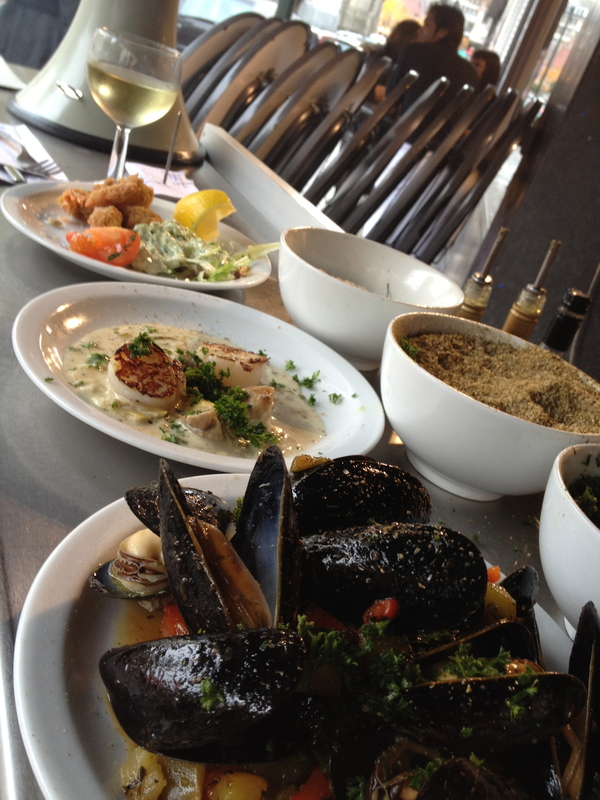 The menu changes everyday, based solely on what’s fresh and on hand. It was late in the afternoon, so there were a few things that had come and gone through their makeshift kitchen, but we were more than satisfied with the fried shrimp, seared scallops, and unbelievably plump and juicy mussels. 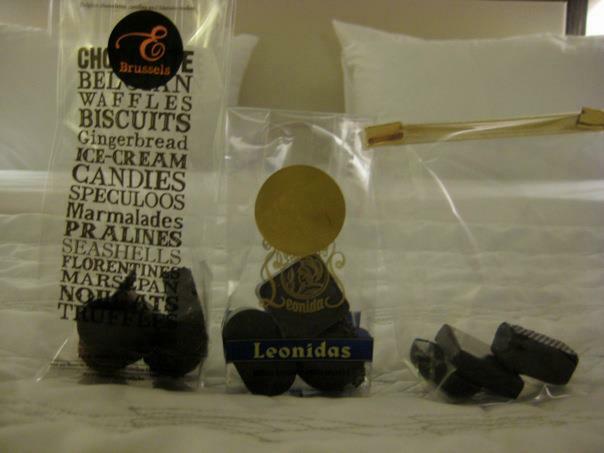 Oh, and how could I forget the Belgian chocolates? We staged our own tasting crawl, and while we didn’t find anything that was bad, we did find some that were substantially better than others. By far our favorite was Elisabeth whose truffles, mint chocolates (with the taste of fresh mint), and candy that was made of their handmade nougat, something crunchy, and covered in chocolate that was so good we took home a whole bunch.